I'm completely in love with Upstate New York. My adoration is rooted in the fact that I grew up in the Fingerlakes, spent my formative years in the 1,000 Islands and Adirondacks, and discovered the beauty of the Catskills in the past decade or so. My partner in crime and I set our sights on the Catskills for a New Year's getaway (to the worst Airbnb I've ever stayed in, but more on that later), and we knew we wanted to visit 260-foot Kaaterskill Falls while we were in the area. The falls are a long-storied Catskill Mountains attraction and are accessible via a yellow-blazed trail maintained by the state. It's an extremely popular spot despite being the site of some controversy around safety, but nonetheless, I couldn't wait to spend some time there under the veil of new snow. 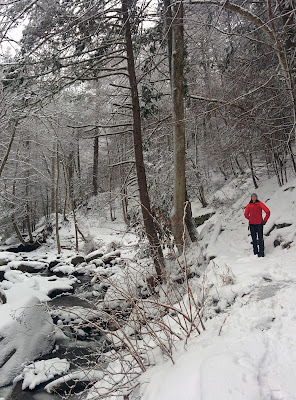 The trail to the bottom of the falls is accessible via a small parking lot off of NYS Route 23A. 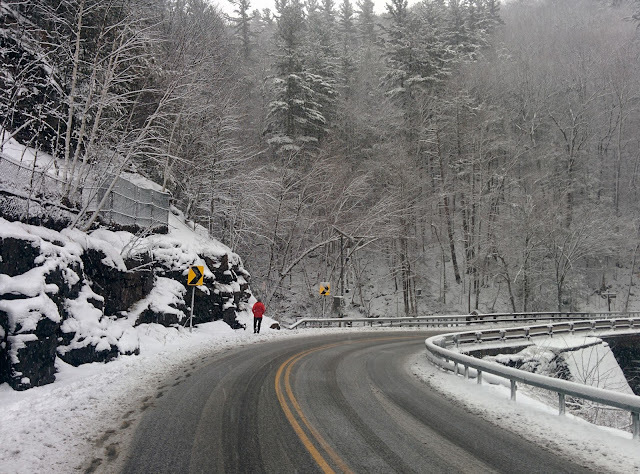 In the vicinity of the falls, Route 23A bends, twists, and turns up, down, and around prominent, beautiful mountains. The parking lot is situated up a steep incline in between two sharp bends, and there was no path down the hill to access the trailhead that we could find. We picked our way 0.2 miles down Route 23A, walking on the non-traffic side of guardrails when we could. I assumed we'd missed a path of some sort, but it turns out, we didn't; there isn't one. The falls are also accessible from the top via Laurel House Road in case you're not interested in the beginning of your hike involving trying to avoid getting hit by a car. We climbed up over big rocks, ascended purposefully build staircases, and marveled at how peaceful and beautiful everything looked. Following Spruce Creek for 0.5 miles, we climbed up to the base of the falls. It was as spectacular as I imagined. Giant icicles hung from each of the two tiers of the falls, rocks sat covered in ice from the spray of the water, and we had the trail to ourselves. From the base of Kaaterskill Falls, all 260 feet of it! From this point, you can turn around and retrace your steps to the trailhead to complete a quick 1.5 mile round trip jaunt, or make your way up a relatively new trail connecting the end of the marked Kaaterskill Falls trail to another trail at the top of the falls, which we chose to do. The connection between the marked trail to the base of the falls and the Escarpment Trail covers 0.2 miles and includes an incredible 200 stone step staircase, constructed by the New York State DEC in 2015. They found that warning signs and fencing weren't enough to keep people from venturing beyond maintained trail areas, so rather than allowing that practice to continue, accommodations to the trail were made. It extended our hike to around 2.0 miles round trip, and though I wouldn't recommend it to everyone, I loved it. Though the hike was only two miles, it took us two hours between stop for pictures and watching our footing! (PC: D. Herscovitch). 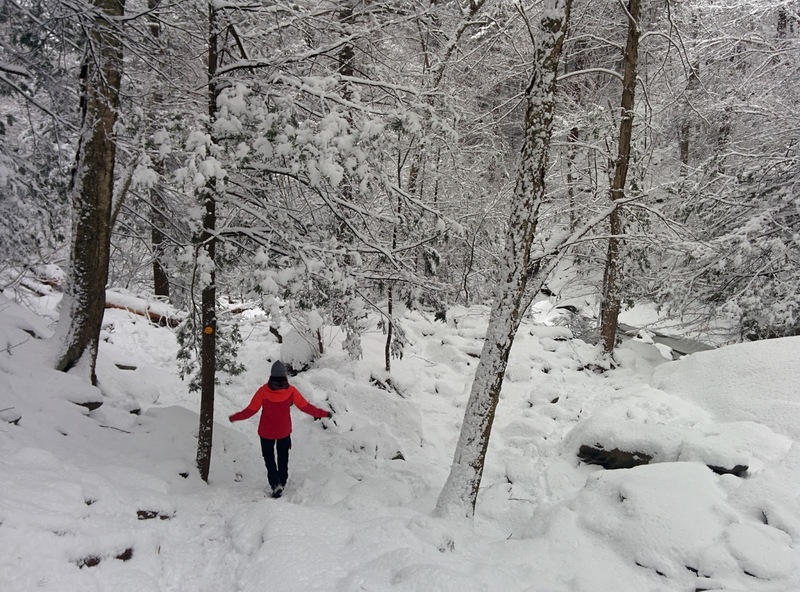 If you're planning this hike in any season, be cautious and prepare. The trail is steep, and even if you just want a quick look at the falls, you're in for a minimum of 0.25 miles of slick trail. Traction devices like Yaktrax are great to have handy in winter. Most trip reports I read cautioned hikers to reserve exploration to the summer months, but I'd be more wary of a crowded, slippery trail than a deserted one. No matter the weather, exploring the falls off-trail might look appealing, but it's a really, really bad idea. 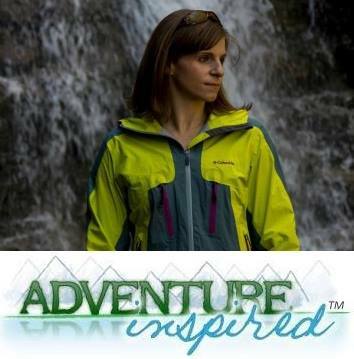 I was shocked at the number of cautionary tales I'd read related to people going off trail and slipping, resulting in severe injury and death, one quite recent. Stay on the trail and wear sturdy shoes. Rumor has it some try to explore this area in flip flops in the summer! If you don't want to do a steep hike, try parking on Laurel House Road for access to the top of the falls. 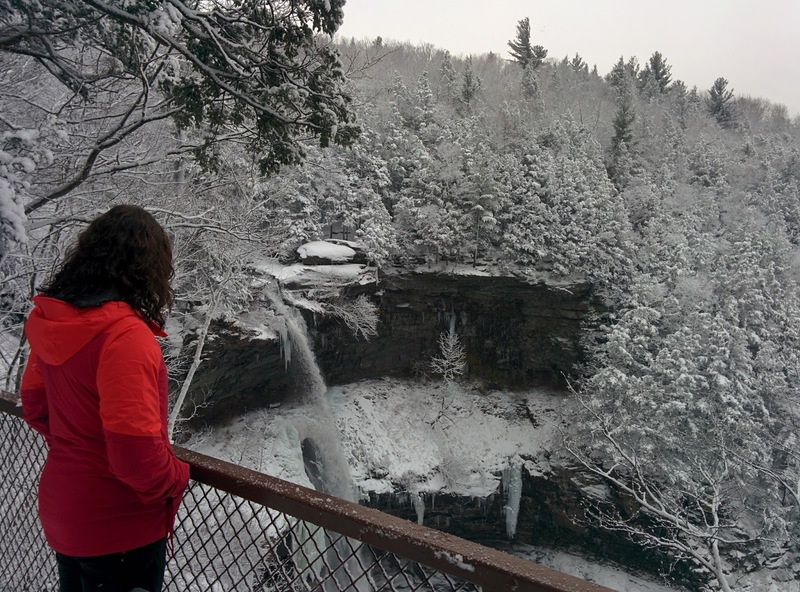 The viewing platform gave us absolutely gorgeous views of the falls from a different vantage point. Get there early during the high season. We didn't have trouble finding a spot in the tiny parking lot on Route 23A on a snowy weekday, but we learned the parking lot fills up quickly in warmer months, and cars often park on the side of the road to access the falls. This was an incredible hike, especially given the fact that we had a normally packed trail to ourselves! 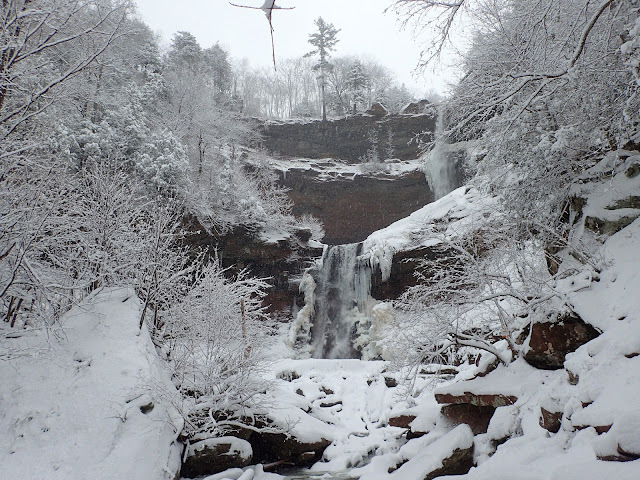 Anyone been to Kaaterskill Falls, or have other favorite day hikes in the Catskills? I'd love to hear from you!